When robots started making milkshakes in fast food restaurants and serving drinks at bars, it seemed like just a matter of time before they started taking orders and serving meals, too. While service industry robots like these are typically looked down on for stealing jobs from real people, pop-up café Dawn ver. β uses them to provide jobs for humans who couldn’t work in most other professions: those with acute paralysis. 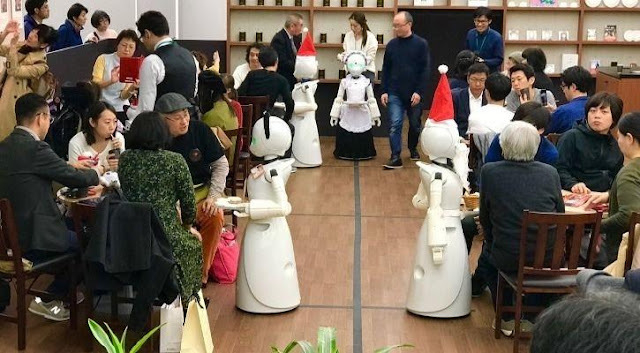 The café’s robotic waiters came courtesy of Ory, a Japanese startup company who created the four-foot tall machines specifically to be controlled by disabled individuals from remote locations. In total, ten people controlled the bots that serviced the café. Two-way microphones and discreet body cameras let the operators hear and see what was happening in real time. 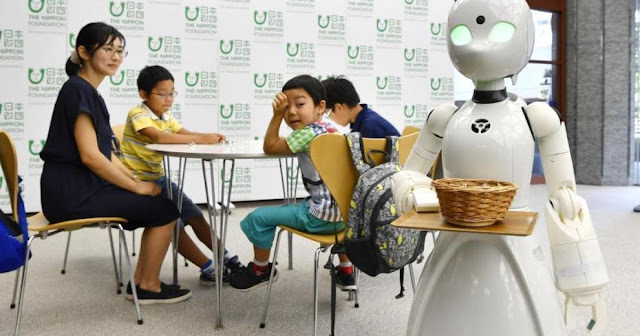 They then used their eyes to make the robots walk, survey their surroundings, have conversations with customers, and deliver food and drinks. A popular 2008 anime called Time of Eve portrayed the future as one in which androids are as common as humans and valued as equals. That fantasy inspired the folks at Ory to manifest it in real life. They entered a joint venture with the Nippon Foundation and All Nippon Airways, and before long Dawn ver. β was born. 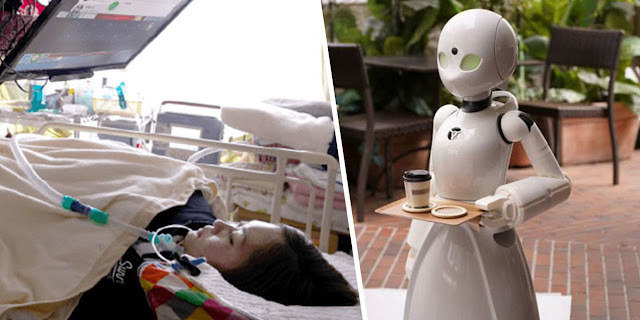 Beyond just proving that robotics can enhance life for everyone, the goal of the pop-up café, which ran from November 26th through December 10th, 2018, was to show how severely disabled people could still do a job that required a pretty extensive amount of movement. The most exciting and progressive part of the undertaking was the fact that it was still humans interacting with the clientele — a huge leap forward from those robots that are simply programmed to repeatedly perform a single task. The Dawn ver. β staff was comprised made up of people with all different forms of paralysis, ranging from spinal cord injuries to ALS. They were each paid 1,000 yen per hour ($8.80 in US dollars), which is the standard wage for most part-time work in Japan. On top of that, they all got to work from their homes or other informal remote environments. No input other than eye movement was used to communicate instructions to the robots. have been around for a while now, proving themselves successful in a variety of scenarios. Most are equipped with cameras, microphones, speakers, and two-way video systems. One of their greatest achievements has been allowing chronically ill children to remotely participate in classroom learning and activities. The bots have also participated in highly extolled graduation ceremonies. 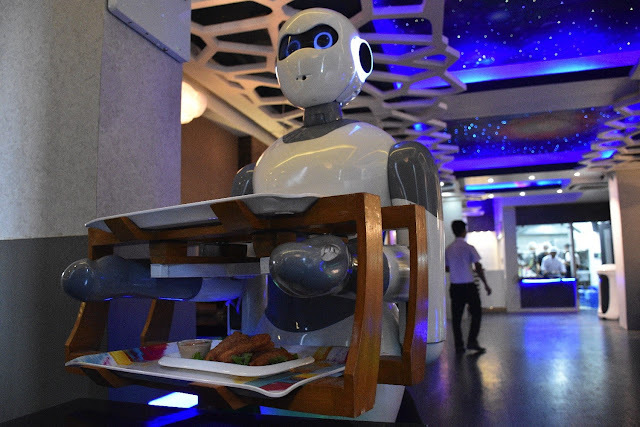 Today, Ory’s robotic waiters face an uncertain future. The company raised money for them from crowdfunding and sponsors, but it’s not enough to open a permanent location any time soon. As is often the case with innovative startups, their future depends on how highly critics rate the success of the pop-up (the reviews are still coming in) and how much investors are willing to put towards a full-fledged operation.